Named for entertainer Dolly Parton, who is part-owner of the resort and grew up just a few miles away, Dollywood has some unique features that set it apart from other resorts and make it especially attractive if you’re traveling with grandparents or a large family group. The theme park is clean and largely shaded with award-winning park entertainment, craftsman shops, and more restaurants and food stands than other theme parks, apart from Disney. If you have an interest in music, you can tour the Southern Gospel Museum and Hall of Fame, located just inside the park, or Chasing Rainbows, a museum featuring memorabilia from Dolly’s life and career. And if you visit on Sunday, the chapel, again inside the park, offers an 11:30 a.m. non-denominational service. But don’t be fooled, Dollywood and Splash Country Water Adventure Park have their share of death-defying, teeth-chattering rides to entertain even thrill-seeking teenagers. KidTripster Tip: Are you traveling with your dog? DoggyWood Kennel and Pet Cottages is located right at the entrance of the amusement park. 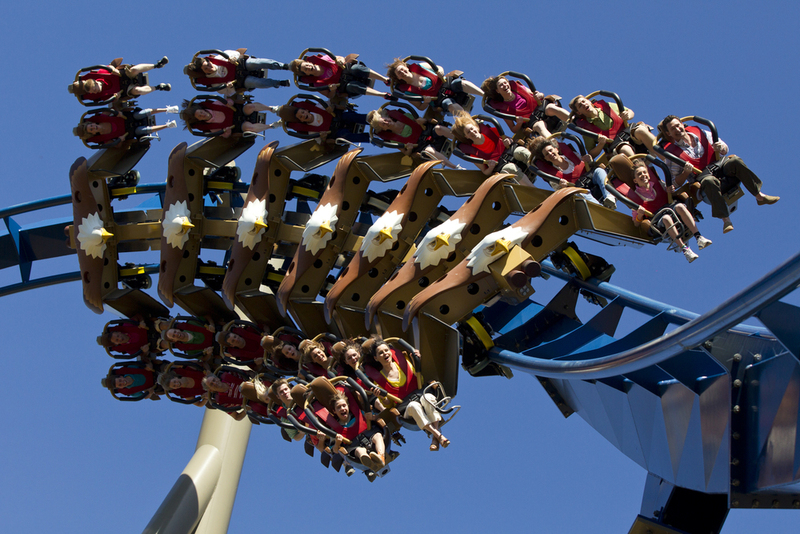 Dollywood is home to the world’s fastest wooden coaster, Lightning Rod, and the world’s first winged coaster, Wild Eagle, plus six others. And given the intense summer heat, you’ll want to hit the Daredevil Falls log ride, too. For the younger set, there are rides just their size, mostly concentrated in the Country Fair section, as well as play areas throughout the park. And while you can buy at Timesaver pass ($30/person) to reserve your place in line at select shows and rides, it’s really unnecessary. Even on a summer weekend, we never waited in line for more than 20 minutes. KidTripster Tip: The summers in Pigeon Forge are hot and humid. While water misters spray throughout the park, you and your kids should be vigilant about keeping hydrated and lathered in sunscreen. Dollywood really tries to cater to young families. Located in Showstreet, the Baby Care Center has a climate-controlled, private nursing area furnished with six gliders and foot stools; there’s also two baby changing stations and a restroom. Cost: Youth (4-11) $52; Adult $65; discounts available on multi-day and multi-park passes. A companion park to Dollywood, Splash Country Water Adventure Park is a welcomed refugee during the hot Tennessee summers, but it also has plenty of hair-raising drops and hairpin turns to get your heart pumping. Our family favorites: RiverRush, a 4-person water coaster, Fire Tower Falls, the park’s tallest and fastest slides, and Swiftwater Run with its corkscrew tunnel. There’s plenty of slides and splash areas for little tykes, too. Splash Country has two Baby Care Centers, plus complimentary life vests for all non-swimmers and small children. Swim diapers must be worn by babies and toddlers not yet potty-trained. Cost: Youth (4-11) $43; Adult $48; discounts available on multi-day and multi-park passes. KidTripster Tip: As is the case with most parks, arriving early is usually the best practice. During the summer, gates open at 10 a.m. to Dollywood and Splash Country Water Adventure Park. The theme park is open until 11 p.m., three hours later than the water park. 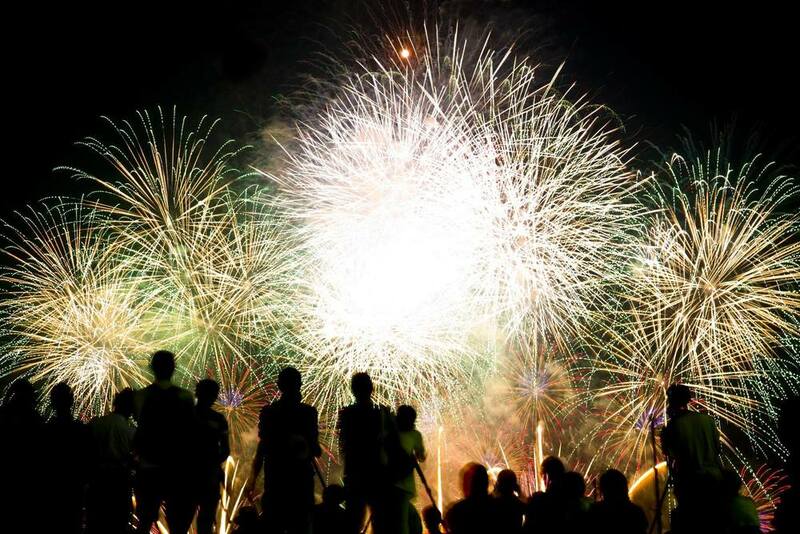 And don’t miss the summer fireworks, which begin nightly at 9:30 p.m.
There’s no shortage of dining options in Dollywood, most with Southern fare. Our favorite is Backstage, a sit-down restaurant that offers much-appreciated air conditioning. The menu has more variety than most restaurants in the park. It’s also a good option for vegetarians, who can make a meal out of the many side dishes like baked beans and macaroni and cheese. And be sure to order the Campfire S’mores, an ooey-gooey treat served in a mason jar, or the banana pudding. Paper table cloths with crayons help entertain the little ones while you wait. If you don’t want to wait, head to the buffet at Aunt Granny’s. Or try Miss Lillian’s Chicken House, if you’re looking for some Southern fried chicken. Splash Country Water Adventure Park has your typical food concessions, plus a place called BeaverTails that serves whole wheat pastries with calorie-free (not!) toppings. Adjacent to the water park, Dollywood’s DreamMore Resort offers nine different room types, all created with families in mind. There’s free trolley service to both parks, an on-site kids’ club, spa, pools, and splash pad. As a guest, you get discounted park tickets and free TimeSaver passes to hold your place in line. Also every Saturday, guests can experience a selected ride or attraction exclusively for one hour before the park opens to the public. Starts at $149/night. Located just two miles from Dollywood's entrance, you can opt to stay in Dollywood Cabins. These luxury cabins with breathtaking views of the mountains (and some with their own game rooms) are ideal for large families. Starts at $139/night. Traffic from Knoxville to Pigeon Forge can be surprisingly heavy, especially if you’re traveling during the summer. And once you arrive in Pigeon Forge, it doesn’t get any better. Be sure to leave more time than you think you’ll need. Alternatively, you can avoid some congestion by skipping most of Knoxville and Sevierville and driving through Maryville and Townsend instead. You’ll then take Wears Valley Road into Pigeon Forge. For more on what to do and where to eat in Pigeon Forge, click here. KidTripster Tip: If you stay at Dollywood, consider using the Pigeon Forge Fun Trolley to explore the town. Check signs and schedules so that you know exactly how late the trolley runs. And when you near your desired stop, make sure to alert your driver that you’d like to get off. Otherwise, the trolley will keep going if no one is standing at that stop. Editor Shellie Bailey-Shah never got to see the acclaimed shows at Dollywood, as she was too busy being pulled on to each and every roller coaster by her husband and two sons. This writer received complimentary admission for the purpose of this review. However, all opinions expressed are solely her own.